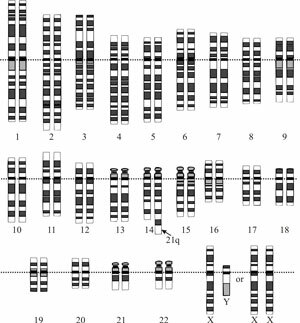 Many people regard chromosome numbers in animals as being essentially fixed. While it is true that chromosome numbers are generally fairly stable within a population of animals, they are by no means completely static. A karyotype from an individual with Down’s syndrome that resulted from a Robertsonian translocation. 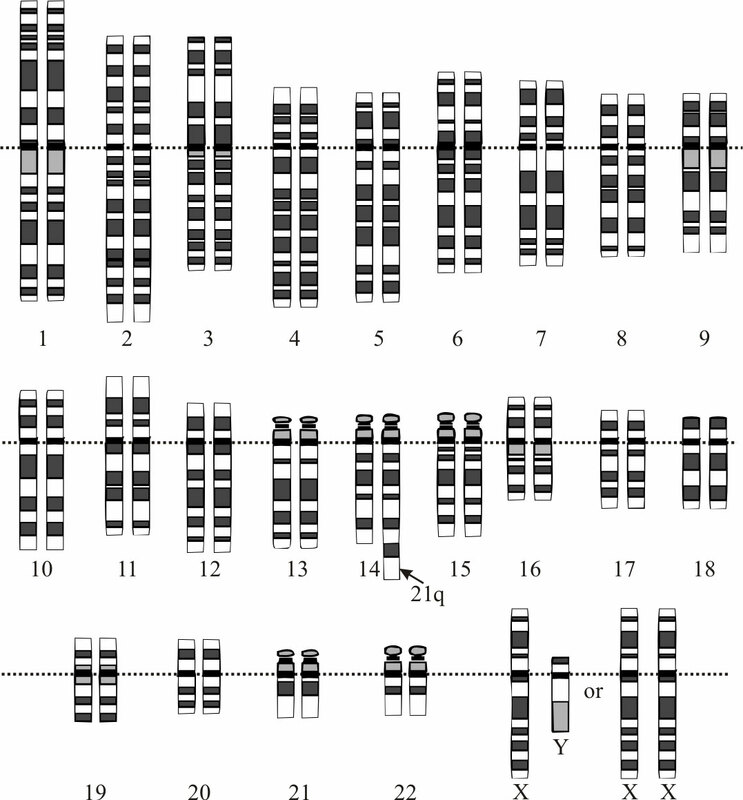 One copy of chromosome 21 is attached to one of chromosome 14 (the translocated chromosome) and two additional copies of chromosome 21 are present. About 5% of Down’s syndrome cases are the result of this type of translocation. ROBs can be associated with problems. In humans, approximately one in 1,000 babies is born with this form of translocation.2 Most appear normal, though they may experience fertility problems later in life. Fertility problems can arise when gametes (egg or sperm) are formed that are missing or have extra chromosomes. Gametes from ROB carriers may be normal, with one of each chromosome or balanced, with the translocated chromosome but neither of the acrocentric homologues. However, on occasion unbalanced gametes may be formed that are either missing a chromosome or have the translocated chromosome with one of its acrocentric homologues. Unbalanced gametes can give rise to embryos which fail to develop or develop with abnormalities such as Down’s syndrome. It is estimated that 5% of Down’s syndrome cases are the result of an ROB. While it is true that chromosome numbers are generally fairly stable within a population of animals, they are by no means completely static. Although ROBs can be associated with problems, there are times where no adverse outcomes are observed. For example, they have been observed in Saanan goats with a normal phenotype and no reported fertility problems.3 There are crossbreeding studies with sheep carrying up to three different translocations that showed no significant effect on phenotype or fertility for any of the combinations.4 In fact, the normal chromosome number of domestic sheep (Ovis aries, 2n = 54) is inferred to be the result of three different translocations relative to domestic goats (Capra hircus, 2n = 60). The variation in chromosome number in the Bovidae family (including the tsoan5 and cattle6 monobaramins) appears to be mostly due to ROBs. ROBs have been shown to be non-random and appear to have distinct mechanisms governing their formation.9 They occur frequently enough without serious consequence to suggest that they serve some useful purpose. Much is unknown; particularly what factors influence their occurrence and what important results they may have. They are believed to have played a role in speciation within the family Bovidae. As further research reveals more information, it is likely we will find still another designed mechanism within the genome that points to an all-wise Creator. Definition of Robertsonian translocation, <www.medterms.com/script/main/art.asp?articlekey=5388>, 26 July 2006. Return to text. sciences/RobertsonianTranslocationResource.asp>, 25 July 2006. Return to text. Mota, L. and Silva, R., Centric fusion in goats (Capra hircus): identification of a 6/15 translocation by high resolution chromosome banding, Genet. Mol. Biol. 21(1):71–76, 1998; <www.scielo.br/scielo.php?script=sci_arttext&pid=S1415-47571998000100012>, 26 July 2006. Return to text. Bruere, A.N. and Ellis, P.M., Cytogenetics and reproduction of sheep with multiple centric fusions (Robertsonian translocations), J. Reprod. Fertil. 57(2):363–375, 1979. Return to text. 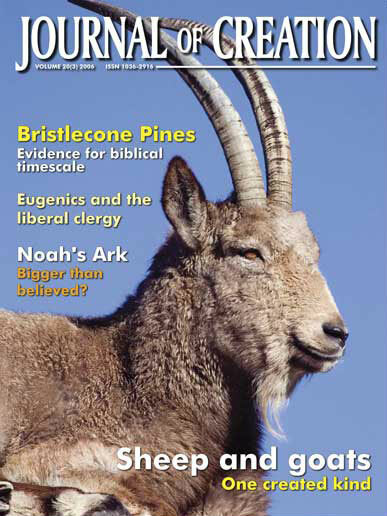 Lightner, J.K., Identification of species within the sheep-goat kind (Tsoan monobaramin), Journal of Creation 20(3):61–65, 2006. Return to text. Lightner, J.K., Identification of species within the cattle monobaramin (kind), Journal of Creation 21(1):119–122, 2007. Return to text. Although the offspring are viable, the males at least are infertile. Fontana, F. and Rubini, M., Chromosomal evolution in Cervidae, Biosystems 24(2):157–174, 1990. Return to text. For example, the bongo (Tragelaphus euryceros, 2n = 33 in males, 34 in females). This species has been crossed with the sitatunga (T. spekei, 2n = 30) to form a fertile offspring. Koulischer, L., Tijskens, J. and Mortelmans, J., Chromosome studies of a fertile mammalian hybrid: the offspring of the cross bongo x sitatunga (Bovoidea), Chromosoma 41(3):265–270, 1973. Return to text. For example, in humans there are five acrocentrics chromosomes (13, 14, 15, 21, and 22). While any of these can be involved in a ROB, all combinations are rare except translocations between 13 and 14, and between 14 and 21. Bandyopadhyay, R., Heller, A., Knox-DuBois, C., McCaskill, C., Berend, S.A., Page, S.L. and Shaffer, L.G., Parental origin and timing of de novo Robertsonian translocation formation, Am. J. Hum. Gen. 71(6):1456–1462, 2002. Return to text.